Launched by the Food and Agriculture Organization (FAO) and Pennsylvania State University, the talking mobile phone app – whose name is Nuru – can identify the insect, which is in fact a caterpillar. Thanks to the Nuru app, identifying a Fall Armyworm infestation is as simple as holding a mobile phone next to a sick plant. Confirmation is immediate, FAO says, adding that the software works on a standard Android phone. Soon, in addition to English, Nuru will be able to speak Swahili, French and Twi. New languages will be added “all the time”, the UN agency noted, so it will be “walking (farmers) through the process of checking their crops…reporting back on infestation levels and giving them advice on how to fight the pest”. 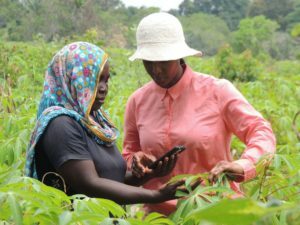 Another important feature of the app is that it can work offline, “so farmers can use it whenever they want it”, said David Hughes, professor of Entomology and Biology at Pennsylvania State University. “Nuru is like an extension officer who is always there for the farmers, in their fields,” he added. Fall Armyworm ­– Spodoptera frugiperda – is native to tropical and subtropical regions of the Americas. The insect first appeared in West Africa in 2016, then spread rapidly across all countries in sub-Saharan Africa in 2017, infecting millions of hectares of maize. The bug prefers maize, but can feed on more than 80 species of plants, including rice, sorghum, millet, sugarcane, vegetable crops and cotton. Because of trade and the moth’s strong flying ability, it has the potential to spread further, the UN agency warns. Posted by Khalid Al Mouahidi on June 26, 2018. Filed under News. You can follow any responses to this entry through the RSS 2.0. Both comments and pings are currently closed.